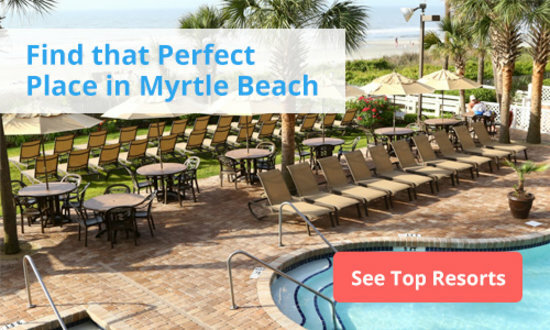 Myrtle Beach vs. North Myrtle Beach | Where to stay? They’ve got the same name (nearly). They’re right next to each other. They’re two of the most visited beach destinations on the east coast. So what’s the difference? What exactly defines these two towns and how are you going to decide where to stay? Living just three hours from the Myrtle Beach area, we consider ourselves lucky to be so close to two of America’s most popular vacation destinations. And we’ve been enough times to have sampled the very best of both Myrtle Beach and North Myrtle Beach. With more than 60 miles of beaches and attractions, this guide will help you select the best location for your Myrtle Beach vacation. 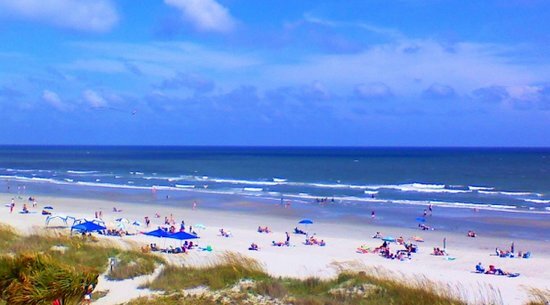 Myrtle Beach, often called the “Grand Strand,” encompasses more than the city of Myrtle Beach itself, extending south into the towns of Surfside Beach, Garden City Beach, and Murrells Inlet. 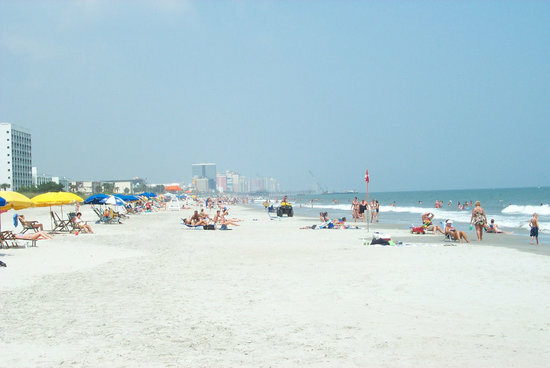 Myrtle Beach has most of the major attractions, including carnivals rides, amusement parks, shopping, and nightlife. About 10 miles north of the Grand Strand sits North Myrtle Beach, a separate city. 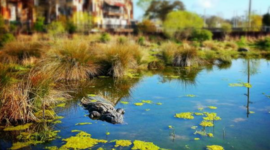 North Myrtle is known for its golf courses, natural beauty, and a more upscale atmosphere. 1. 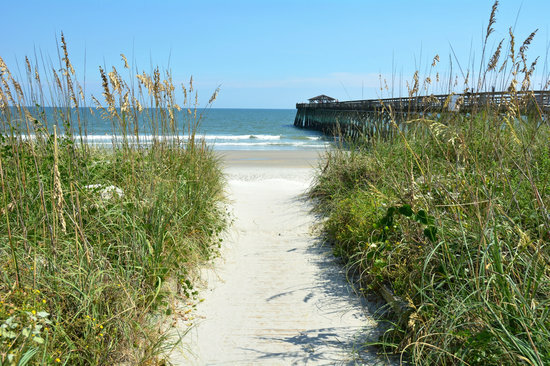 Know the beaches – A vacation in Myrtle Beach is, first and foremost, about the beach! In general, the sand along the Grand Strand and North Myrtle Beach is the same. At low tide, the beaches are wide, sloping gently to the water, and well-maintained. Both areas offer public life guards in public beach areas during tourist season. Both areas offer rentals of beach chairs and umbrellas, beach patrols and all the water activities vacationers would want and expect. When it comes to choosing a beach, there’s absolutely no wrong answer. The same sand, sun and surf will be there to greet you! 2. 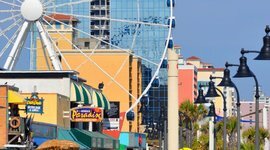 Consider the hustle and bustle – In general, Myrtle Beach is more crowded and louder than North Myrtle Beach, though you might not notice it in high season when roads are crowded with vacationers from around the world. Restaurants and attractions are plentiful at both places, though on holidays and summer weekends, guests might experience long wait times. The major difference between the two areas is Myrtle Beach’s Boardwalk, ranked third best in the United States by National Geographic. The Oceanfront Boardwalk and Promenade, which stretches from the 14th Avenue to 2nd Avenue Piers, hosts huge festivals and events. The midsection offers a carnival-like atmosphere complete with an amusement park. While the Boardwalk is family-friendly, it does create “noise” that guests will not experience in North Myrtle Beach. Other oceanfront attractions, like clubs, bars, and popular shops near the beach area at Myrtle Beach, create a nightlife buzz that guests at resorts in North Myrtle Beach are less likely to experience. With that said, there’s no right answer as to which is best. Sometimes, it’s fun to be “in the middle of it all,” and enjoy the excitement that the Boardwalk area creates. Sometimes, it’s nice to get away to the beach and enjoy a slower pace. When our kids were young, we preferred North Myrtle Beach because it’s a bit less crowded and the pace is slower. Now, we look forward to the excitement of the Boardwalk and other Myrtle Beach attractions. Consider which “atmosphere” you prefer for your Myrtle Beach getaway and choose a resort that fits the mood. 3. 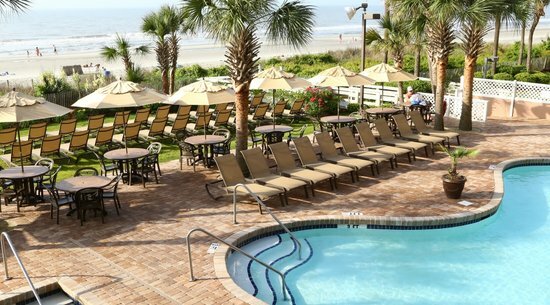 Understand parking options – If you plan on spending most of your time at the beach, you should consider Myrtle Beach resorts within walking distance of the beach to avoid parking hassles. When we visit during the summer, especially mid-June through July, we always rent condos on the beach. It costs a little more than those further out, but it’s nice not fighting for parking spots. Guests who don’t rent at beachfront resorts in the Myrtle Beach area should consider parking options when making vacation plans. Parking in North Myrtle Beach is free and many lots offer amenities like restrooms, showers, handicapped spaces and paved spaces. The number of spaces is limited, though, and guests might struggle to find a place to park during peak season. More parking is available in Myrtle Beach, particularly at Myrtle Beach State Park and Huntington Beach State Park, but they charge an admission fee ($3.80/person at time of this writing). The state parks reach full capacity in the summer months, especially on weekends and holidays so it’s best to arrive early. Throughout the City of Myrtle Beach, parking meters offer short term and all-day parking. Red sticker spots offer 3-hour, short-term parking at a rate of $1.50/hour. All-day parking at green stickered spots are $6.00/day. Parking is free during the winter months from November 1 to February 28. 4. 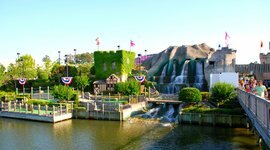 Consider the attractions you want to visit – When comparing Myrtle Beach vs. North Myrtle Beach you must note that they are 10-15 miles from each other. But, during the busy summer season, driving that distance can take up to an hour! If you want to do something that is location specific, consider staying at the beach closer to that attraction or event. With that said, both places offer many similar attractions. 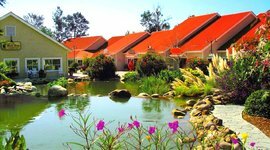 Water sports, golf, dining, shopping and miniature golf are available at both places. Consider these popular location specific attractions when deciding where to stay. 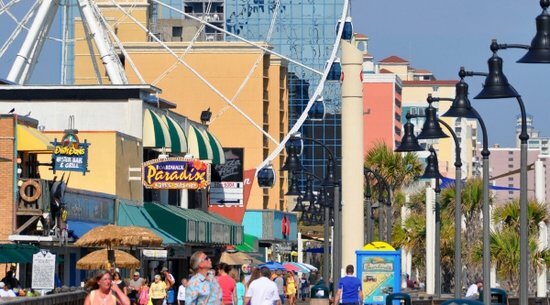 Broadway at the Beach – Broadway at the Beach is the epitome of all things Myrtle Beach, great shopping, over-the-top entertainment and fabulous dining. 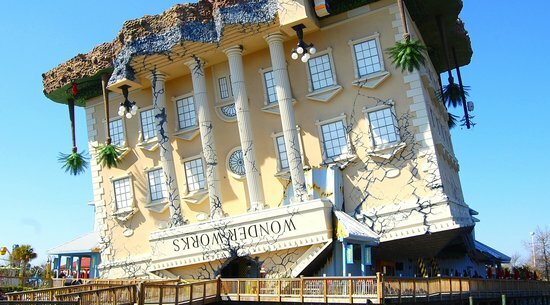 This one stop attraction in Myrtle Beach offers 25 popular restaurants including Jimmy Buffett’s Margaritaville and Señor Frogs, a variety of attractions from Ripley’s Aquarium to the enormous Palace Theater, helicopter rides and everything in between, not to mention lots of shopping, nightlife, and seasonal fireworks shows. Family Kingdom Amusement Park – Sitting along 13 acres right next to the ocean, Family Kingdom Amusement Park has 37 rides, including the Swamp Fox roller coaster – the only wooden coaster in South Carolina – and the Giant Wheel, a 100-foot tall gondola style Ferris wheel that gives you panoramic views of the entire Myrtle Beach area. Admission options include all day wristbands or tickets to be used for individual rides only. 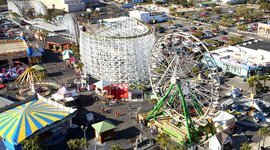 The Ferris wheel is one of the best attractions at Myrtle Beach; individual rides are $3.45 (three tickets). 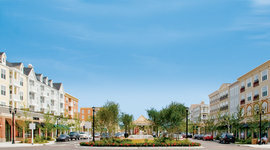 Market Common – Myrtle Beach Vacationers looking for luxury resorts, lush parks, designer shopping and upscale dining, might consider Market Common, a destination within a destination! Located off Farrow Parkway and a couple miles from the beach, this neighborhood destination caters to guests who want to be pampered. Of course, vacationers can visit this shopping, dining and entertainment complex for a day and enjoy all the amenities as well. Enjoy movies under the stars, carriage rides, live bands and even a Saturday morning farmers’ market. Barefoot Landing – Similar to Broadway at the Beach, but with an emphasis on the natural environment, Barefoot Landing offers dining, shopping, attractions and nightlife catering to the North Myrtle Beach crowd. Set along the Intracoastal Waterway, it complements the natural beauty of the area with fun and excitement. Alabama Theater – If it’s music and dance shows you crave, the Alabama Theater is a must. 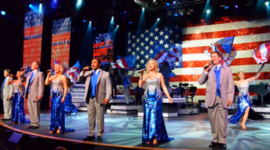 Consistently ranked the best entertainment attraction in the greater Myrtle Beach area, this North Myrtle Beach theater puts on the famous “ONE – The Show” on a regular basis and hosts special musical guests and seasonal performances. Check their website for promotions and discounts. 5. 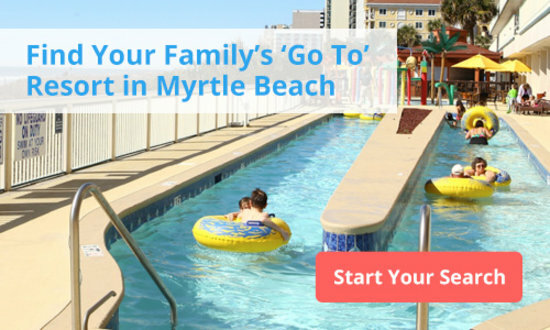 Decide which type of family accommodations you desire – While both areas offer a wide variety of lodging options: houses, condominiums, hotels, motels and even camping, the North Myrtle Beach area is generally newer. 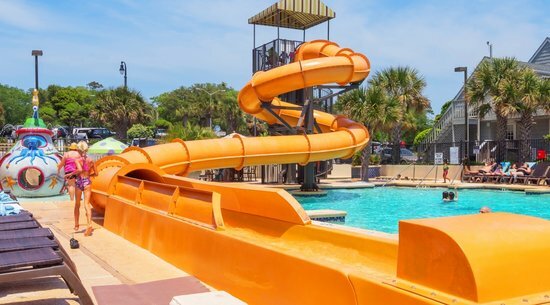 North Myrtle Beach resorts are more likely to offer upgraded amenities like lazy rivers, beachfront pools, exercise rooms and more. Condo resorts in North Myrtle Beach tend to have more modern decor, including luxurious master bathrooms and expansive decks. When booking accommodations, consider the amenities included with your stay, when the building was completed or most recently renovated, and the size of the condo offered. An older unit with fewer amenities should cost you less than a newer resort with all the bells and whistles. 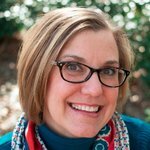 Karen Dawkins is the creator of Family Travels on a Budget, a website dedicated to helping fami-lies travel better for less. As she says, “Budget doesn’t mean cheap. It’s smart!” She has also been featured in print and online publications, and podcast. Follow her adventures on Twitter, In-stagram, Facebook and Pinterest.